Access to the Internet is an increasing problem in many areas of the world. As the popularity and usefulness of the Internet increases on a daily basis, lack of access to the technology is putting many groups at a disadvantage in terms of better education, better jobs and even in terms of higher levels of civic participation. However, creating a network infrastructure to serve outlying communities and sectors of the population is not straight-forward. This book brings together all the aspects of the problem - technical, regulatory and economic - into one volume to provide a comprehensive resource. It describes the latest technological advances that allow cost-effective network infrastructures to be built, and places them in the context of the applications and services that the infrastructure will deliver. A section on business models and case studies from North American and Europe demonstrate that the solutions are economically and practically viable. This book is essential for anyone looking to gain an understanding of the issues and technology surrounding the access debate. 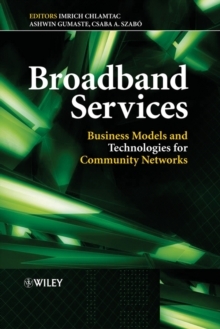 It will be of particular relevance to network engineers/designers/planners at the incumbent operator companies charged with delivering broadband access to as yet unconnected regions. Governments and regulatory bodies will also find this a useful guide to the problems that they may face.